With a short break in Cyprus, it was back in the air again, this time to Geneva, with some rather long luggage in the form of Dee’s skis. Landing at Geneva, we hopped in a 4WD and headed towards Megeve. We’d found a hotel, walking distance from the ski lift and it turned out to be a good choice. Megeve has 4 different ski fields, and Dee managed to ski all four whilst I re-acquainted myself with the art of (un)controlled falling down a snow-covered mountainside. The Megeve town was postcard perfect, complete with cutesy churches, Xmas trees and bars selling mulled wine. After 4 days skiing, it was time to take a day off and head to Chamonix, another of those cutesy (but expensive) famous ski towns. We managed to find Dee’s favourite restaurant from years ago and enjoyed a nice Valentines Day lunch overlooking the river. 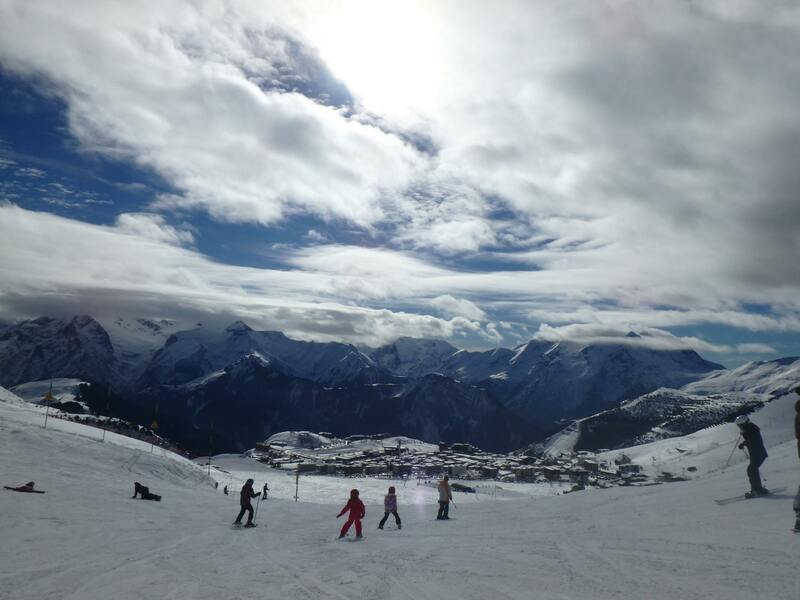 Our next stop was La Plagne, where we had some of our best skiing. La Plagne is linked to Les Arcs by a huge gondola, which carries over 100 skiers at a time. By this stage I was starting to enjoy skiing Red runs and was feeling comfortable zipping down the mountain. That was right up to when I was half way down a really nice red run that went for miles, when I hit a section with some really gnarly moguls. Somehow I’d managed to skip the Moguls 101 class and I came to grief on a turn. My skis stayed on and I thought I was going to break a leg. In the end I (only) managed to tear my calf muscle quite badly. I managed to get over to a blue run and slowly skied down on half a leg – until I made it to the bar where I stayed for the rest of the afternoon until Dee was able to ski back to our hotel and drive around to where I was – a good couple of hours later. Next day I could hardly walk, so I confined myself to the small village whilst Dee skied. Then it was time for another rest day anyway, so we headed off once more to Alp D’Huez, spending most of the day driving there. It was an interesting drive up to the resort, looking at signs with all the winners of the Tour De France that had to ride up the 20 something switchbacks to the top. As my friend Spike did last year in a moment of madness. Alp D’Huez was where I got back on the bike (skis) and tried a few easy green runs to see how I went. I struggled at first but then managed to do some blues by the end of the day. Dee meanwhile had skied all over the mountain and declared it DONE, so we checked out the next day and headed for Italy. On the way we went through a very, very, very long tunnel – over 20kms. I was excited to roll up in Piedmonte and enthusiastically checked out the wine lists and bottle shops as soon as I got there – there being the cute village of Sous Deux. There were a few good wine bars that got checked out that night if I can remember rightly. Next morning it was off to find the snow. We got to the bottom of the lifts to see a thin covering of snow. Not good. As we went up the lifts we could see more ice than snow. The first run was more like ice skating than snow skiing. Our aim was to get across to Sestriere, which we accomplished using a series of ski lifts (both up and down) and not much actual skiing. Once in Sestriere, I found the lifts closed because of wind – I’d like to say high winds, but not really. Eventually I got to an open lift and had a good few hours skiing on okay snow. Then it was time to find my way back to Sous Deux. This involved going up the gondola and skiing down a goat track. Turned out to be a very icy goat track. It was now snowing with no visibility, and the goat track was a layer of ice-covered by a thin layer of snow. Deadly! Well, deadly to a novice skier with a bad calf. I managed to lose control at speed and crashed, falling on both knees. I remember thinking this snow is really hard as my knees banged into the ice. Ouch. Luckily I hadn’t gone that far so I was able to walk (slowly) up the goat track to the top of the gondola, which took me back to Sestriere. From here, I took a bus back to Sous Deux, my ski trip over courtesy of not one but two non-functioning knees. Dee was still going strong so we went off to look for better snow. We found it in Cervinia, on the other side of the Matterhorn from Zermatt in Switzerland. Dee had fun skiing across to Zermatt, whilst I checked out the Trauma Centre for a couple of matching knee X-rays and some expensive knee braces. After Dee had her fill skiing, she graciously put her skis away and we went touring. We headed back to Piedmont to try to find some open wineries, but it wasn’t tourist season and they were all closed. 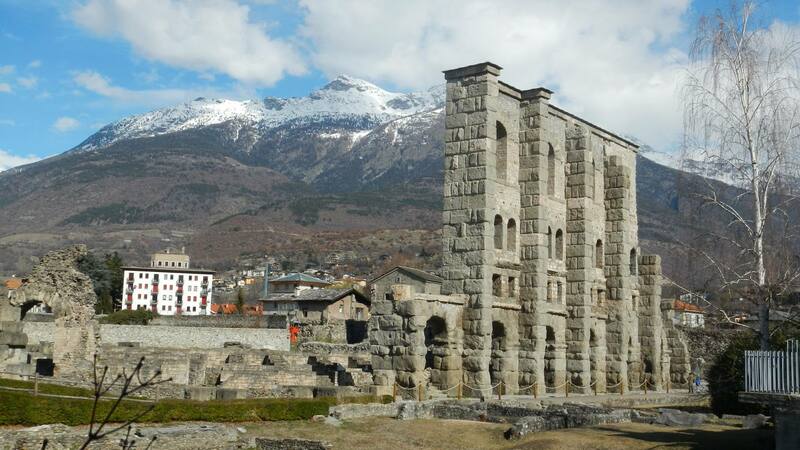 We had a nice drive out of Italy, along a the beautiful Aosta valley, stopping at Roman ruins, historic towns and castles to Courmayeur, where we had a look see but did not stop and ski. Then it was through the Mt Blanc tunnel and off to Annecy for the night. Annecy is really beautiful, set on the Lake that bears its name, it is sometimes called theVenice of the Alps with its two canals and the river Thiou flowing through the old city. We hit upon a student show at the old gaol that is in the middle of the river that night, which was rather fortunate as the gaol wasn’t normally open to the public. Next day we headed to Lyon for our last few days of the trip. What a brilliant French city. We had a great time, wandering the various neighbourhoods of Lyon, visiting great churches, historic old town, great museums and squares and monuments. The Lumiere museum was a highlight – Lyon was where the Lumiere brothers did their stuff. We even found time to go and see a Joe Jackson concert – a blast from the past. Skiing and touring over, we drove back to Geneva and headed back to Cyprus. This entry was posted in France, Italy by stull61. Bookmark the permalink.